You know what special day is coming up on May 9th? National Moscato Day! Yah! 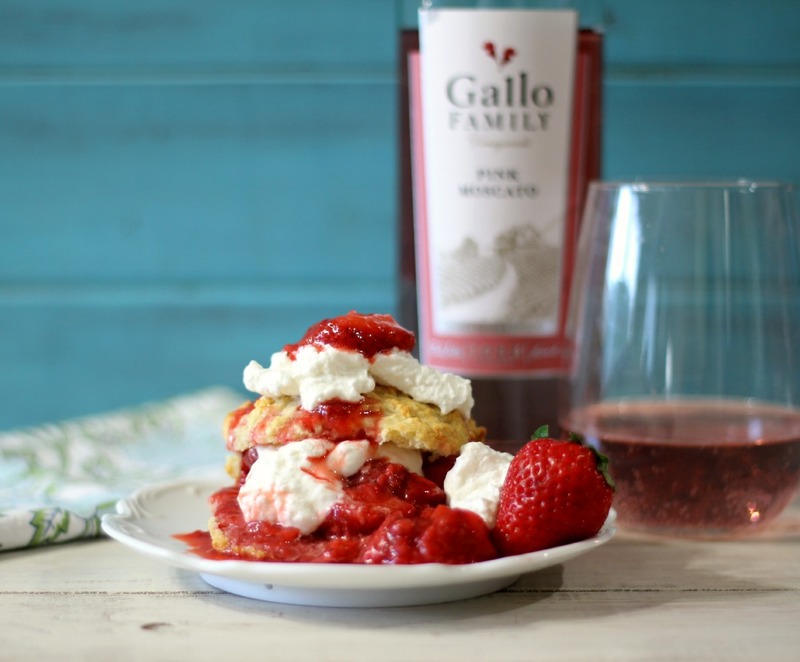 So for #SundaySupper our mission is to make a fabulous dish with Gallo Family Vineyard Moscato Wine. Oh yes, please! I have to admit, since I have been cooking with wine lately, I am loving it! I feel like a gourmet chef, not to mention I have been overly impressed with the dishes! Speaking of impressed, today’s recipe is Ahhhhhhmazing!!! I have for you Pink Moscato infused Strawberry Shortcake. This is truly a restaurant style dessert!! I have to admit something else too! This recipe is mine, yes, but it was my friend at work who came up with the idea. When it was suggested to make strawberry shortcake, I was all over that idea. After all, me, strawberries and Pink Moscato, ummm, yes please!!! I couldn’t wait to start making it!! After I made my recipe I took two shortcakes to work so everyone could try them. My friend, the idea maker, said it was excellent! That I did a good job! The words used were yummy! I also got great reviews from everyone, plus I was asked for the recipe! Yah! I have to admit this recipe really did impress me!! It is so good, if you love strawberry shortcake, you will love this recipe! It’s a perfect spin-off of traditional strawberry shortcake. I first started the recipe off, by making a drop biscuit. I have done shortcake in ramekins, but this is much easier and the biscuits came out so moist and light. The only glitch I had, was I was out of baking powder. So I decided to make my own. All it is, is 1/4 cup cream of tarter and 2 tablespoons of baking soda sifted together. I was really concerned that the biscuits weren’t going to turn out, but they did! The biscuits are made with flour, baking powder, salt, sugar, butter and milk. Give a mix and drop heaping tablespoons onto a baking pan. Bake for 10 minutes and they are done! How easy is that? 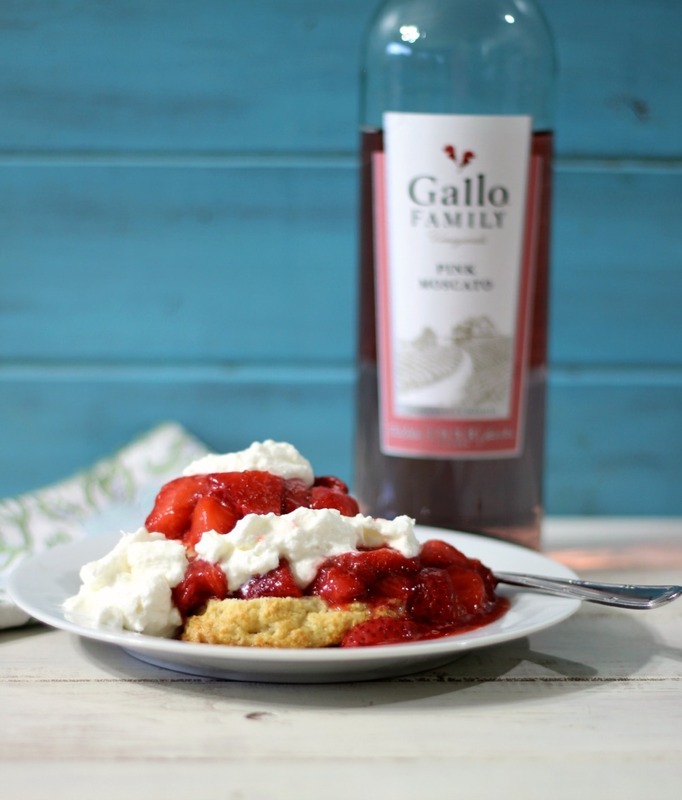 When the biscuits were baking, I made a thick, juicy, sweet strawberry topping that was cooked in Gallo Family Vineyards Pink Moscato Wine. Have you had GFV Pink Moscato? It is delicious. It’s sweet, light, with hints of citrus, berries and peach. The perfect light drink, plus a perfect complement to my strawberries. I just cooked my strawberries with the Pink Moscato and added a little sugar, until it was thick and bubbly, let it cool and the spoon over the biscuits. Oh my! It tasted so good the night I made it, but the next day, the strawberries and the Pink Moscoto really infused together and the flavor was out of this world. I kid you not, you must make strawberries with GFV Pink Moscato, even if you skip the biscuits, so good! The berries were perfectly sweet, but not overbearingly sweet. I personally don’t like a super sweet strawberry shortcake, but I like one that tastes more light and fresh! Oh, you can check out the strawberries cooking on my Instagram, right here! Now for the whip cream. I had to make my own, I couldn’t use already made whip cream because after all I had to add a special touch to my whip cream to take it up a level. What did I add to my whipping cream as I beat it together with only 2 tablespoons of sugar? Pink Moscato Wine. Sounds crazy, but it really isn’t. The flavor is very light, and not super sweet, I think it is perfect! 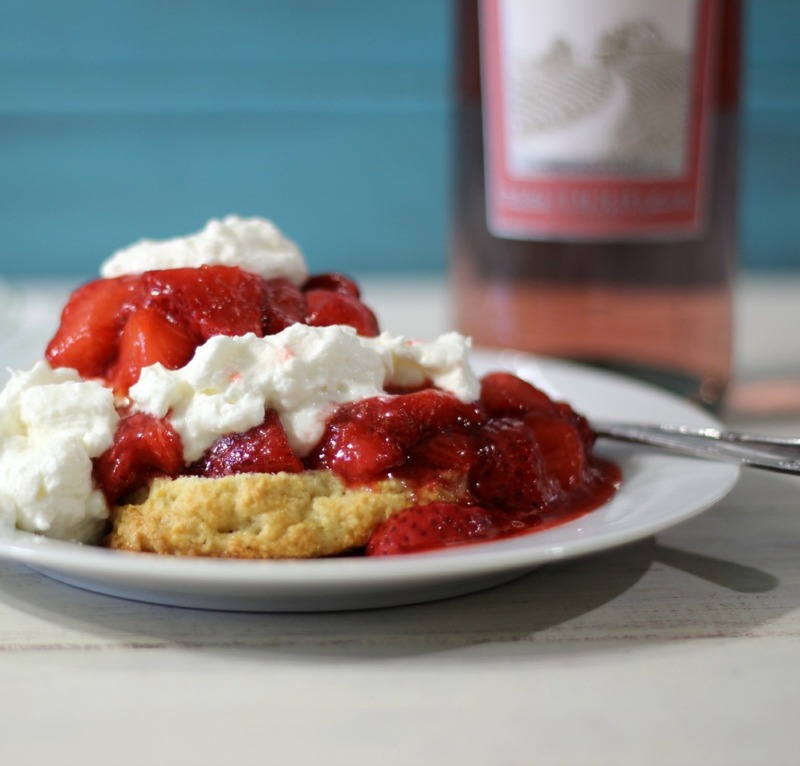 A light refreshing dessert, made with homemade drop biscuits that have been topped in Pink Moscato infused strawberries and homemade whip cream. In a large bowl, add flour, baking powder, salt and sugar; mix until combined. Cut in chilled butter until it forms course crumbs. Mix in milk until a dough forms, and pulls from the side of the bowl. Evenly drop 8 mounds of batter onto baking sheet. Place in oven and cook for 10 - 12 minutes, until lightly brown. Let cool on baking sheet for two minutes then remove to a cooling rack. 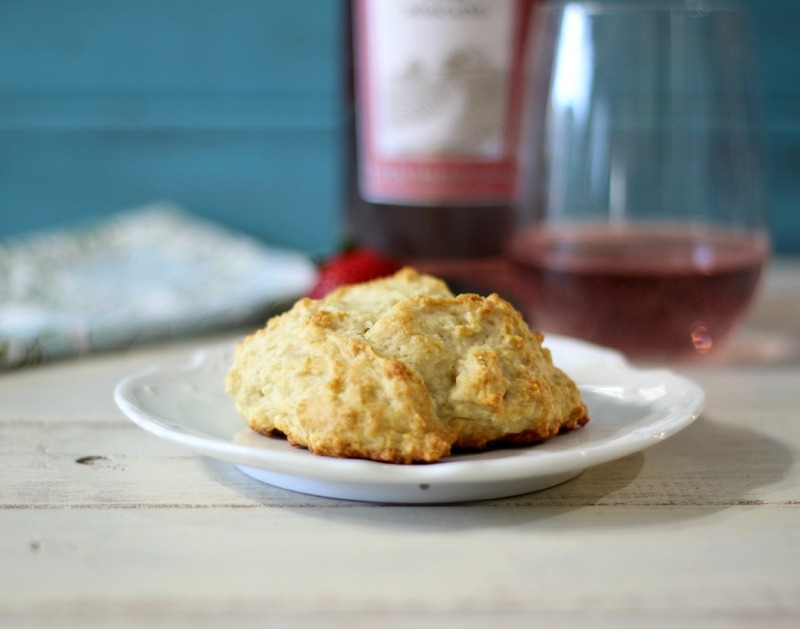 While biscuits are cooling, in a large skillet over medium low heat, add strawberries, Moscato Wine and 2 tbsp. sugar. Stir constantly until thick and bubbly; about 8 -10 minutes. Let cool. Meanwhile make whip cream, In a large bowl; Add whipping cream, 1 tbsp. Moscato Wine and 1 tbsp. sugar, beat together until thick. Put the shortcake together, by topping shortcake with strawberries and add a dollop of whipping cream. Another option is you can cut the shortcake in half, horizontally, add strawberries and whip cream, to half the biscuit; top with other half of biscuit on top to make a sandwich. Top with more strawberries and whipping cream if desired. I have one piece of advice for this recipe, you may want to double up on the strawberries to use in other dishes like yogurt, toast, bread, oatmeal or more. The strawberries just blew my mind. 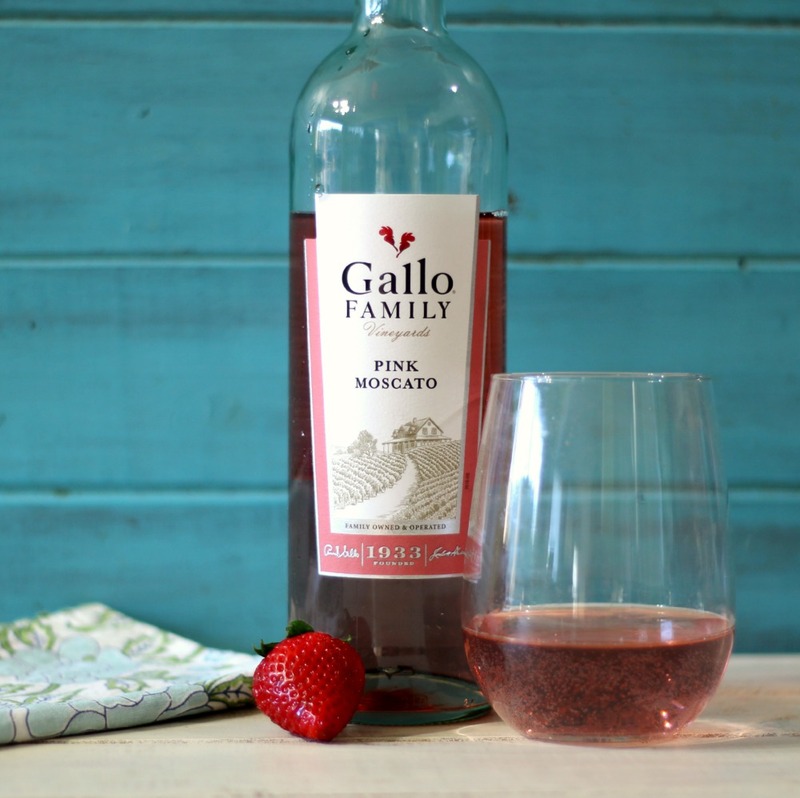 Since I happen to have strawberries and Gallo Family Vineyards Pink Moscato left over, after I finish writing this post, I will be making more strawberries! I LOVE it!! You can also get a $1.00 off coupon here. I hope you celebrate National Moscato Day with us and whip together a fabulous dish using this light, fresh, sweet wine. Need more ideas? Be sure to check out what the #SundaySupper crew whipped together. I can’t wait, my favorite part of Sunday is reading everyone’s posts. You can find Gallo Family Vineyards Wines here. You can also check out Gallo Family Vineyards website for their wine varieties and some great recipes. I’ve already printed the recipe and I’m making this for the moms in my family for Mother’s Day. Love it, love it! Thank you so much Renee! This is a great dessert to have for Mother’s Day! I am sure your Mom and family will love it as much as we do! I love how you threw together your own baking powder and saved the day! This looks delicious and I can’t wait to try your recipe! Yah, running out of baking powder, was crappy, at least you can make your own! 🙂 Thank you so much for the compliment!! If you try the recipe, let me know what you think! I think you will love it! Ohh this sounds so divine!!! Mmmm I want some! You should make some, it’s easy and so good!! Om nom nom! Jennifer, I love this recipe! Strawberry shortcake is one of my very favorite desserts, and you just kicked it up a notch. Pinned. Thanks Jennie! I have to admit Strawberry Shortcake is probably one of my all time favorite desserts. This is a Strawberry Shortcake that I need to get to know!! I love strawberry shortcake so much and I’m sure adding Moscato only makes it taht much more fabulous! The addition of Moscato is just amazing in this dessert. Strawberry shortcake is one of my favorite desserts! Yours looks scrumptious! And thanks for the tip on baking powder! Sounds and looks absolutely delicious – the perfect dessert for Strawberry month! Thank you so much Melanie! I just love strawberries!! Call it a happy accident to soak the berries overnight. I can just imagine the infusion of flavors. Looks delicious! Thank you so much!! I love how the berries soaked it up the next day, even better than the first! Who doesn’t love strawberry shortcake? Love that it’s infused with the moscato! Thank you so much! I love this dessert too! I kind of have a thing for strawberries and Moscato. Oh wow………I have to make this for my husband….ok me too!! 😉 teeeheee!! You both are going to love it! I have to say this is my favorite strawberry shortcake recipe ever! Let me know how she likes it! It’s an amazing dessert. Strawberries and moscato are so good together! This reminds me of the very first time I had a glass of moscato. My friend put strawberries in our glasses and let them soak up the delicious wine. After we finished our glass, we were left with moscato-infused strawberries and they were SO yummy! Strawberry infused Moscato is just a wonderful flavor. I am so glad you shared your story with me. Aren’t cooked strawberries the best? I made some this morning but I think I might follow you next time and add the Moscato. Yes! I just love them cooked!! 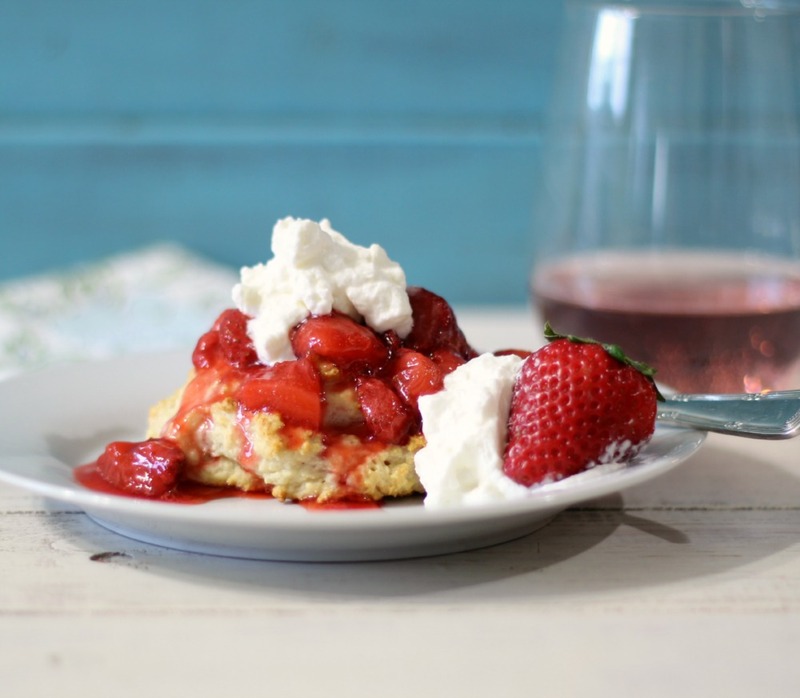 You must add Moscato next time you make strawberry shortcake, it’s an amazing combination! I love this! Strawberry Shortcake and Moscato together. Perfect! Thank you so much Constance!! Strawberry shortcake is one of the best non-chocolate desserts out there! This is one of my mom’s favorites, so I’ll have to make it for her! I have to admit Strawberry Shortcake is one of my all time favorite desserts ever! Moscato is my favorite wine 🙂 This looks so great!! This looks so luscious and deliciously perfect. Better than anything I’ve seen at a restaurant, that’s for sure! Oh my gosh, thank you so much for the compliment!! You made me smile!